Once upon a time, my brother and I were beguiled by Genuine Oriental Malay Throwing Knives they had for sale at Metuchen Center. I mean, what could be cooler than that? And besides, Christmas was coming! And the deadly knives were well within even our meager price range–a steal at 75 cents each. So we conspired to give each other Genuine Oriental Malay Throwing Knives as Christmas presents. When the presents were unwrapped on Christmas morning, we earned some sour looks from the obvious source. But my mother needn’t have worried. 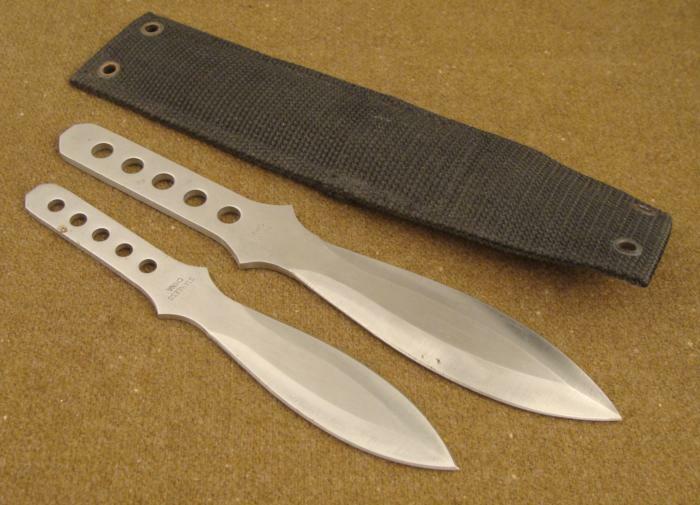 The Genuine Oriental Malay Throwing Knives wouldn’t cut a piece of bread. I can only imagine what Genuine Occidental Malay Throwing Knives could do. And no matter how many times you threw your throwing knife at a tree, it always struck with a “Splat!” instead of with that satisfying “Thwunggg!” that you always hear in movies. It always, always hit the tree flat, never, never with the point. As a self-defense weapon, these babies were perfectly useless. You’d have a better chance fending off attackers with ribald limericks. As projectiles, they were only very slightly better than plaster statues of Liberace. But at least they were cheap! This entry was posted on Sunday, December 23rd, 2018 at 11:10 am	and tagged with cheap presents, Christmas presents, nostalgia, throwing knives, vintage 1960s toys and posted in Just for Fun, memory lane. You can follow any responses to this entry through the RSS 2.0 feed. Well, while your opponent was laughing at your weapons, you could have taken advantage of his vulnerability and punched him … I suppose. Later on in life, I used these knives in judo demonstrations. They were as harmless as rubber knives, but the audience didn’t have to know that. Did they advertise the knives like something Robin Hood would possess? Only if Robin Hood were an Oriental Malay.